What Made This City So Very Special? 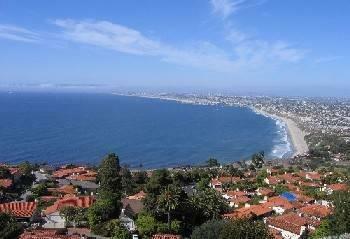 Palos Verdes Estates is on the coast in Los Angeles County. Redondo Beach is to the north; San Pedro to the south. The city of Palos Verdes Estates is known for its magnificent ocean, city and coastline views (often referred to as the Queens Necklace) and its tranquil environment and excellent schools. It is unique in the amount of protected open space, predominance of custom homes, and good air quality. Homes in the city are custom designed and building plans must be approved by the Palos Verdes Homes Association and Art Jury prior to being submitted to the City Building Department. This process was established in the 1920s to maintain the integrity of architectural designs and ensure that the CC&Rs for each lot were met. These CC&Rs specify such items as the maximum building height allowed on each lot, the number of stories permitted on the lot, type of roofing material required or permitted, and architectural styling. The rules were prescribed in the original subdivision of the City by landscape architects and city planners brought here from New York where they were responsible for designing Central Park. The owners of the land wanted to secure the natural beauty of the Peninsula and particularly the area that would later be incorporated as Palos Verdes Estates. To that end, they established building regulations for all future homes and all commercial buildings as well. In fact, so many small commercial centers (plazas) were set aside that many have been used instead for single-family homes. They designed roads, parklands for ocean space, and set aside school sites. The farsighted planners guaranteed that the city would be developed with a cohesive plan that would protect the environment and the natural beauty of the Peninsula. The City of Palos Verdes Estates was incorporated in December, 1939. Formerly part of a land grant to Don Delores Sepulveda, the land was purchased by Jotham Bixby for farming and grazing. Many legal disputes were waged over ownership, but eventually the land was sold in 1913 to Frank A. Vanderlip, Sr., a New York City financier who had magnificent visions for the area that included a yacht harbor. Vanderlip's plans were thwarted by World War I and later the Great Depression, but he is credited with the creation of the building restrictions that have preserved the magnificent views and beauty of the land that ultimately became the city of Palos Verdes Estates. These restrictions provided for an architectural review process administered by the Palos Verdes Homes Association and the Palos Verdes Art Jury. The Olmsted Brothers, sons of Frederick Law Olmsted, Sr., who designed Central Park in New York City were hired to create a landscaping plan for the barren but scenic land. With great vision, the Olmsted Brothers created a subdivision plan that preserved 28% of the land as parkland in the area that would become Palos Verdes Estates. This area and its development were administered by the Palos Verdes Homes Association. In their plan they created lot setbacks and other building restrictions forming the CC&Rs for the lots. Olmsteds' goal of ensuring a rural aspect and substantial open space has served the area very well. Their insight and provisions have protected land in steeper terrain and in ravines from development, thus protecting the city from overdevelopment and other problems that have plagued other seaside communities. You will see a tribute to the work of Frederick Law Olmsted, Sr., in a small park in Malaga Cove that is dedicated to him. Two other figures contributed greatly to the beauty of the city, Charles H. Cheney, a nationally-noted architect and city planner, and Kirtland Cutter, an architect of note from the Pacific Northwest, who had ties with the Olmsted Brothers. Kirtland Cutter designed many of the noteworthy early homes in Palos Verdes Estates as well as the Bathhouse and Beach Club in 1929 which is located on the cliffs in Malaga Cove. Much of the vision of Frank Vanderlip, Sr., for development of the Palos Verdes Peninsula was thwarted by World War I and later by the Great Depression, thus the fabulous yacht harbor and recreational development he envisioned were never realized. His legacy remains in the protection and beauty of Palos Verdes Estates that was incorporated in 1939 and in the protection of its parklands, which were deeded to the new city in 1939. The other continuing legacy of Frank Vanderlip, Sr., was design of the city of Rolling Hills, which would be incorporated at a later date. Among the historic properties in Palos Verdes Estates are the Gardner Building in Malaga Cove Plaza, the Malaga Cove Library designed by Myron Hunt, Malaga Cove School, Mirlo Tower on Via Valmonte at the City entrance and La Venta Inn. Each of these is shown in the accompanying virtual tour. Peninsula). School performance throughout the District is among the highest in California. Exact scores can be found under the button heading "School Information." The campuses are situated in residential areas and often have outstanding views, having been acquired when land was readily available and inexpensive. Over the years school population has fluctuated at times causing excess space. When the District was considering the sale of excess properties, the community rose up to prevent such sales. The result is currently being appreciated as schools have been reopened to accommodate increasing needs. There are currently two high schools (Palos Verdes High School in Lunada Bay and Palos Verdes Peninsula High School in Rancho Palos Verdes, known as Peninsula High School.) There are three intermediate schools (Palos Verdes Intermediate School in Lunada Bay, Ridgecrest Intermediate in Rancho Palos Verdes near Crest Road and Crenshaw Blvd, and Miraleste Intermediate on the east side of the Peninsula in Rancho Palos Verdes. Presently, there are eleven elementary schools but the District has discussed the possibility of reopening Valmonte School, which for some time has served the neighborhood for Kindergarten only. The school site has been District headquarters for some time. remodels in the city. The first hurdle to cross is the Homes Association and its Art Jury. A preliminary visit to the office is recommended to gain information on what will be needed and how to approach the approval process. The basic reviews done by the Homes Association and Art Jury are based upon the unique recorded CC&Rs for the particular property. These identify the number of stories allowed on the site, the maximum height, type of roofing material and design style. All modifications of the exterior of properties require approval, including changes in paint color (generally done without charge or difficulty), replacement of windows (they all need to be of the same style and of an approved design for the property), installation of skylights, etc. Fees are charged based upon a schedule that can be obtained from the Homes Association. The Art Jury (a panel of architects) reviews submitted plans (they must be signed by a licensed architect) and notifies the applicant of its decision. Changes are often required to meet the design objectives of the panel of architects. When final approval is obtained the project can be taken to the City. The second phase of the process is the Planning Department review. There the project enters the review for conformity with the "Neighborhood Compatibility Ordnance," which is more restrictive that the CC&Rs. Recorded CC&Rs, for instance, on an 8,000 sq.ft. lot might have allowed a 2-1/2 story structure. Accordingly, the upper two stories could have had 4,800 sq.ft. (based on 30% lot coverage) plus another 1,000 sq.ft. for the garage level, for a total building size of 5,800 sq.ft. Thus you will find older homes on relatively small lots in the city that are large compared with homes built more recently. For comparison, the need to conform to "Neighborhood Compatibility" now will mean that this same 8,000 sq.ft. lot may only have a structure of 4,150 sq.ft., including the garage & storage, even when the garage is placed under the house on sloped land. This is based upon 30% of the lot size plus (if the lot CC&Rs allow more than one story) an additional 1,750 sq.ft. Thus, older homes might have a total of 5,800 sq.ft. compared with newer homes that would be limited to 4,150 sq.ft. Furthermore, the City usually states that the maximum size is a guideline and they do not expect any designs to reach the maximum "permissible" size. The term Mansionization" came to the Peninsula some years ago when residents in Malaga Cove were incensed that a resident changed the profile of his home to such an extent that it obliterated the views of others uphill. The resulting outcry produced legislation that has made new construction and remodels conform to very restrictive , if not punitive, rules that pit owner against owner as neighbors now have an almost veto power over proposed plans. Invasion of privacy is often the claim to defeat an applicant's design...because "from a new window someone might be able to 'see' into the current window or backyard of the existing owner." The upside of this ordnance is that, upon purchase, one's view is somewhat better protected. Back to the process . . . Upon submittal of the project to the Planning Commission where some change will occur in the size or shape of the dwelling, the applicant begins the time-consuming process of notifying neighbors, erecting sticks to show the proposed shape, and meeting with neighbors to enlist their support of the project. Often the applicant must go before the Planning Commission in open session to defend his project. If it is declined an appeal may be made to the City Council. When Planning Commission approval is obtained, design changes have likely been required, thus the entire project must be returned to the Art Jury. In time, hopefully, all of these approvals will be in place and the owner can meet with the Building Department to obtain needed permits for construction. Unfortunately, some residents have become so disenchanted by this stage that after the building process has been completed they no longed want to reside in the neighborhood. Other cities now mimic some of these conditions, but with the Art Jury, Palos Verdes Estates and with similar oversight the cities of Rolling Hills Estates, and Rolling hills, may be too difficult to deal with as a homeowner. This may be the time to leave such projects to the professional builders. The Norris Theater for Performing Arts located in Rolling Hills Estates has two locations close to Crossfield Drive for performances and gatherings. These facilities were built from funds donated by members of the community and offer space for local groups to present their programs in addition to providing featured professional performances. The city sponsored creation of an organization called PVE-Cares to track the well-being of elderly residents in the city and try to assist them in avoiding predators who prey on senior citizens, especially affluent ones. The City Police Department manages the program. An annual senior health fair is offered to encourage participation in the program and to provide health and dental screening. More information is available here. The Palos Verdes Estates Police Department sponsors Neighborhood Watch and the annual Residents Night Out to encourage residents to look out for one another and to build and maintain good association with the policemen in the city. More information on this organization can be found here. Palos Verdes Estates under the direction of the Palos Verdes Estates Police Department participates in the Community Emergency Response Team (CERT) directed by Los Angeles County Fire and Sheriffs Departments. The main Post Office for the Peninsula is located at the corner of Silver Spur Rd. and Deep Valley Dr. in Peninsula Center. Postal Annexes and substations can be found in other areas, including Malaga Cove in Palos Verdes Estates.